Within the 2016 World Health Organization (WHO) category of "acute myeloid leukemia and related neoplasms," the related neoplasms derive from immature cells with evidence of myeloid differentiation, or from precursors of plasmacytoid dendritic cells. 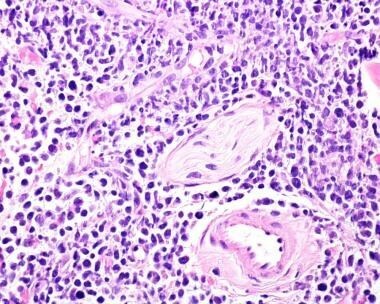 [1, 2] These disorders include blastic plasmacytoid dendritic cell neoplasm (discussed in this article); transient abnormal myelopoiesis and myeloid leukemia associated with Down syndrome; and tumoral proliferation of myeloid blasts that effaces the underlying tissue architecture (myeloid sarcoma). Skin involvement by blastic plasmacytoid dendritic cell neoplasm. The pDC markers, CD123 (strong), TCL-1 (90% of cases), CD45RA, blood dendritic cell antigen (BCDA)-2 (expressed in more mature cases), and myxovirus A (MxA) may be detected by flow cytometric immunophenotyping (FCI) and/or immunohistochemical (IHC) staining. A subset of cases may demonstrate CD2 positivity, weak CD7 positivity, weak CD33 positivity, TdT positivity (up to 50% of cases), and CD68 positivity. By definition, BPDCN must lack expression of lineage-specific markers such as CD3 and myeloperoxidase. Extensive phenotypic characterization may be necessary, especially given the overlap with some acute myeloid leukemias, especially those with monocytic differentiation. A pediatric case involving a CD4-negative variant of cutaneous BPDCN with a novel PBRM1 mutation has also been described. The patient's histologic and immunohistochemistry findings revealed a monotonous proliferation of blasts that were CD4-, CD56+, and CD123+. Kim MJ, Nasr A, Kabir B, et al. Pediatric blastic plasmacytoid dendritic cell neoplasm: a systematic literature review. J Pediatr Hematol Oncol. 2017 Oct. 39 (7):528-37. [Medline]. Philippe L, Ceroi A, Bole-Richard E, Jet al. Bortezomib as a new therapeutic approach for blastic plasmacytoid dendritic cell neoplasm. Haematologica. 2017 Nov. 102 (11):1861-8. [Medline]. [Full Text]. Kim HS, Kim HJ, Kim SH, et al. Clinical features and treatment outcomes of blastic plasmacytoid dendritic cell neoplasm: a single-center experience in Korea. Korean J Intern Med. 2017 Sep. 32 (5):890-9. [Medline]. [Full Text]. Liu XY, Atkins RC, Feusner JH, Rowland JM. Blastic NK-cell-like lymphoma with T-cell receptor gene rearrangement. Am J Hematol. 2004 Apr. 75 (4):251-3. [Medline]. Aoyama Y, Yamane T, Hino M, Ohta K, et al. Blastic NK-cell lymphoma/leukemia with T-cell receptor gamma rearrangement. Ann Hematol. 2001 Dec. 80 (12):752-4. [Medline]. Brody JP, Allen S, Schulman P, et al. Acute agranular CD4-positive natural killer cell leukemia. Comprehensive clinicopathologic studies including virologic and in vitro culture with inducing agents. Cancer. 1995 May 15. 75 (10):2474-83. [Medline]. Petrella T, Dalac S, Maynadie M, et al. CD4+ CD56+ cutaneous neoplasms: a distinct hematological entity? Groupe Français d'Etude des Lymphomes Cutanés (GFELC). Am J Surg Pathol. 1999 Feb. 23 (2):137-46. [Medline]. DiGiuseppe JA, Louie DC, Williams JE, et al. Blastic natural killer cell leukemia/lymphoma: a clinicopathologic study. Am J Surg Pathol. 1997 Oct. 21 (10):1223-30. [Medline]. Herling M, Jones D. CD4+/CD56+ hematodermic tumor: the features of an evolving entity and its relationship to dendritic cells. Am J Clin Pathol. 2007 May. 127 (5):687-700. [Medline]. Jegalian AG, Buxbaum NP, Facchetti F, et al. Blastic plasmacytoid dendritic cell neoplasm in children: diagnostic features and clinical implications. Haematologica. 2010 Nov. 95 (11):1873-9. [Medline]. Feuillard J, Jacob MC, Valensi F, et al. Clinical and biologic features of CD4(+)CD56(+) malignancies. Blood. 2002 Mar 1. 99 (5):1556-63. [Medline]. Kameoka J, Ichinohasama R, Tanaka M, et al. A cutaneous agranular CD2- CD4+ CD56+ "lymphoma": report of two cases and review of the literature. Am J Clin Pathol. 1998 Oct. 110 (4):478-88. [Medline]. Petrella T, Bagot M, Willemze R, et al. Blastic NK-cell lymphomas (agranular CD4+CD56+ hematodermic neoplasms): a review. Am J Clin Pathol. 2005 May. 123 (5):662-75. [Medline]. Reichard KK, Burks EJ, Foucar MK, et al. CD4(+) CD56(+) lineage-negative malignancies are rare tumors of plasmacytoid dendritic cells. Am J Surg Pathol. 2005 Oct. 29 (10):1274-83. [Medline]. Tzankov A, Hebeda K, Kremer M, et al. Plasmacytoid dendritic cell proliferations and neoplasms involving the bone marrow : Summary of the workshop cases submitted to the 18th Meeting of the European Association for Haematopathology (EAHP) organized by the European Bone Marrow Working Group, Basel 2016. Ann Hematol. 2017 May. 96 (5):765-77. [Medline]. Pilichowska ME, Fleming MD, Pinkus JL, Pinkus GS. CD4+/CD56+ hematodermic neoplasm ("blastic natural killer cell lymphoma"): neoplastic cells express the immature dendritic cell marker BDCA-2 and produce interferon. Am J Clin Pathol. 2007 Sep. 128 (3):445-53. [Medline]. Chaperot L, Bendriss N, Manches O, et al. Identification of a leukemic counterpart of the plasmacytoid dendritic cells. Blood. 2001 May 15. 97 (10):3210-7. [Medline]. Gopcsa L, Banyai A, Jakab K, et al. Extensive flow cytometric characterization of plasmacytoid dendritic cell leukemia cells. Eur J Haematol. 2005 Oct. 75 (4):346-51. [Medline]. Roth CG, Robinson LJ. Case study interpretation-New Orleans: case 5. Blastic plasmacytoid dendritic cell neoplasm. Cytometry B Clin Cytom. 2013 Sep-Oct. 84 (5):354-7. [Medline]. Leroux D, Mugneret F, Callanan M, et al. CD4(+), CD56(+) DC2 acute leukemia is characterized by recurrent clonal chromosomal changes affecting 6 major targets: a study of 21 cases by the Groupe Français de Cytogénétique Hématologique. Blood. 2002 Jun 1. 99 (11):4154-9. [Medline]. Hallermann C, Middel P, Griesinger F, Gunawan B, Bertsch HP, Neumann C. CD4+ CD56+ blastic tumor of the skin: cytogenetic observations and further evidence of an origin from plasmocytoid dendritic cells. Eur J Dermatol. 2004 Sep-Oct. 14 (5):317-22. [Medline]. Bernasconi P, Boni M, Cavigliano PM, et al. Molecular genetics of acute myeloid leukemia. Ann N Y Acad Sci. 2002 Jun. 963:297-305. [Medline]. Rigolin GM, Cuneo A, Roberti MG, Bardi A, Castoldi G. Myelodysplastic syndromes with monocytic component: hematologic and cytogenetic characterization. Haematologica. 1997 Jan-Feb. 82 (1):25-30. [Medline]. Kaur V, Swami A, Shebli A, et al. A rare case of blastic plasmacytoid dendritic cell neoplasm with deletion 7q.31, in the setting of heavy pre-treatment with alkylating chemotherapy. J Oncol Pharm Pract. 2017 Oct. 23 (7):552-6. [Medline]. Yigit N, Suarez LF, Roth LG, Orazi A, Tam W. CD4-negative variant of cutaneous blastic plasmacytoid dendritic cell neoplasm with a novel PBRM1 mutation in an 11-year-old girl. Am J Clin Pathol. 2017 May 1. 147 (5):453-60. [Medline]. Julia F, Dalle S, Duru G, et al. Blastic plasmacytoid dendritic cell neoplasms: clinico-immunohistochemical correlations in a series of 91 patients. Am J Surg Pathol. 2014 May. 38 (5):673-80. [Medline]. Assaf C, Gellrich S, Whittaker S, et al. CD56-positive haematological neoplasms of the skin: a multicentre study of the Cutaneous Lymphoma Project Group of the European Organisation for Research and Treatment of Cancer. J Clin Pathol. 2007 Sep. 60 (9):981-9. [Medline]. Kharfan-Dabaja MA, Al Malki MM, Deotare U, et al. Haematopoietic cell transplantation for blastic plasmacytoid dendritic cell neoplasm: a North American multicentre collaborative study. Br J Haematol. 2017 Dec. 179 (5):781-9. [Medline]. Montero J, Stephansky J, Cai T, et al. Blastic plasmacytoid dendritic cell neoplasm is dependent on BCL2 and sensitive to venetoclax. Cancer Discov. 2017 Feb. 7 (2):156-64. [Medline]. [Full Text]. Blasts of stem cell leukemia.